Rumor: iPad 2 to be released In March | It-11 Audio / Tonegeek"
← Motorola Xoom nonconformist ! Later this month, we could get to see what Apple has planned for the next iPad. It has almost been a year since the iPad was released and the next one is coming pretty much any time now. Japanese blog, Macotakara, says that Apple is waiting for the Chinese New Year to conclude (Feb 17) before announcing the next-gen iPad. They also say that Apple plans to start shipping shortly after in March. 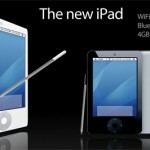 Regardless of the rumors validity, iPad 2 is on its way soon. This entry was posted in What's up, doc ? and tagged apple, ipad2, march. Bookmark the permalink.